Frama (2012-2014) - Old wooden decoys. Folder - Pack with the 3 mint ATMs, and one card with the 3 ATMs and the corresponding first day postmarks. Frama (7.02.2014) - Old wooden decoys (3) - Velvet Scoter. Mint ATM (00,01 EUR). Frama (7.02.2014) - Old wooden decoys (3) - Velvet Scoter. First day cover mailed to Spain (01,10 EUR). Frama (7.02.2014) - Old wooden decoys (3) - Velvet Scoter. 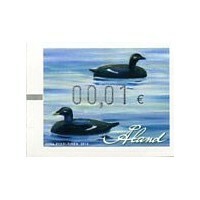 Pictorial first day cover with the 4-values set (00,80-00,90-00,95-01,10 EUR). Frama (7.02.2014) - Old wooden decoys (3) - Velvet Scoter. Maximum card with ATM (01,10 EUR). Frama (7.02.2014) - Old wooden decoys (3) - Velvet Scoter. Mint set 4 values (00,80-00,90-00,95-01,10 EUR).